I made a promise to myself to blog more this summer and haven’t made good on that promise primarily because I didn’t have anything to write about. This fits exactly into what I want to discuss in this post. I am about to embark on a new journey in a new position at my school. I was chosen to become the new literacy coach for the high school and I’m both nervous and excited about the job. One of the needs expressed by teachers this past spring was a desire to focus more on writing instruction. We have noticed that our students struggle quite a bit with writing. Even students who appear to have very little delay in reading. Students show an ability to understand what they are reading but struggle to pose their own thoughts in writing. What is missing in writing instruction that will help students make gains? I recently read a fabulous article on Linking Genre to Standards. The premise of the article being that students need exigency in order to exact good form. It is a habit of writing programs to teach formulaic writing–especially when working with students who are performing several levels below Enrolled Grade Level. The problem with formulaic writing is that it may give students a “purpose” for writing, but it doesn’t make that purpose authentic and it doesn’t help students understand why the form is used. It also does not put the choice of form in the hands of the student. As teachers, before we direct our students toward ways to engage the interest of the reader and state a clear purpose, we have to engage the interest of the writer in a real purpose. When working on instructional planning, we have to do more than just make sure we check off the standard’s list of genres (making sure that students write at least one engaging short story, literary analysis essay, persuasive essay, research paper, etc.). We need to impress upon students that writing is an organic meaningful action. Students shouldn’t just write to receive a passing grade. Writing isn’t about playing “school”. It is about sharing a message. It is about expressing one’s thoughts and feelings. It is about engaging and interacting with an audience. But, as the quote above stated, we cannot get our students to engage an audience without first making sure students are engaged in the topic. Their writing should have authentic purpose; it should be a meaningful, purposeful act. We need to ask ourselves, what situation would students need to be in that would engage them as authentic writers? Why would/should they write this story? One could argue that standardized testing does not engage readers or writers and I would agree, which is why I would encourage administrators not to put so much stock in standardized test scores. Should writing instruction be designed around testing parameters? or should we work to develop meaningful writing skills and hope for transfer? Teaching form as formula may have short-term benefits that help prepare students for immediate writing tasks. However, it also creates limited writing competencies and disconnected learners. Skills don’t “stick” and writing loses voice. In developing an effective writing program, we cannot continue to go the route of formulaic instruction in order to meet the demands of a singular assessment. We must help students find meaning in writing and write with their own purpose in mind. We must consider the “why” along with the “how” when designing lessons. We must create meaningful learning situations that prompt specific genres or forms of writing. We don’t just want students to do well in school or on tests, we want them to do well in their respective communities. We want them to be able to see writing as a meaningful tool for participating in social action. I write this blog because I have something to say. 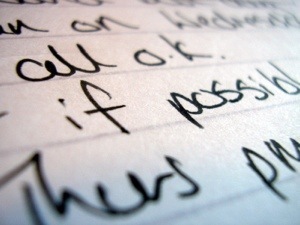 Having something to say motivates me to write well. Having something to say and a desire to share it with an audience encourages me to carefully select my words and consider how my writing might be received by others. This is what we want our students to do. They must be reflective readers and writers, but first, they must find something to say. Rather than give them something to say, give them a reason to say it. Incite them, move them to action–show them that writing is more than just structure, grammar and words on a page. Writing is power.